It’s almost Christmas! And that sometimes means last-minute Christmas sewing. My go-to last minute gift is nearly always a zipper pouch. They sew up quickly and are pretty easy. But when rushing sometimes I do things that I wish I wouldn’t have. Like cutting the pull tab off a zipper. I can’t tell you how many times I’ve been partway through a zip pouch, trimmed the zipper, and then realized what I’ve done while staring at the dead zipper. 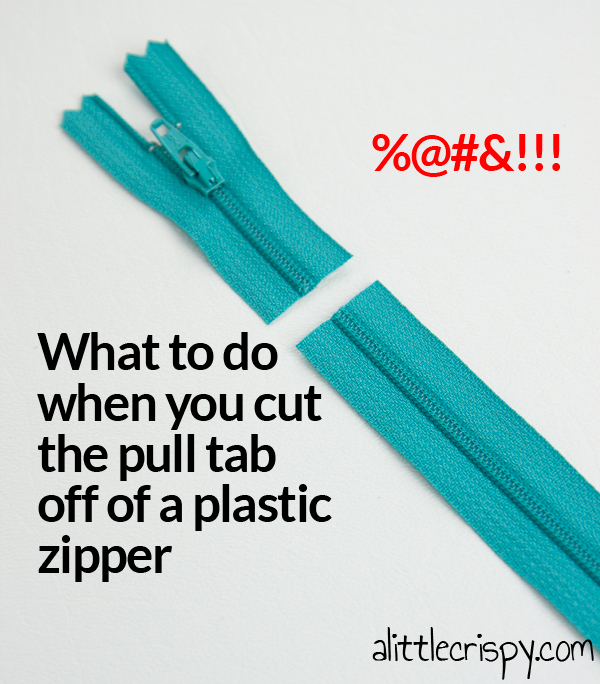 I have tried and tried to push the tab back onto the top of the zipper. Let me save you the effort. It doesn’t work. At all. I thought that once the zipper pull was off then the zipper was garbage. But this year I came across a tip to get the zipper pull back on! The trick is that you need to put it back on the BOTTOM. Hurray! Now, this will only work to save the current project if the zipper is still longer than what you need, but at least the zipper can be saved for another project if the fix winds up making it too short. And I’m guessing this only works on plastic-teeth zippers. 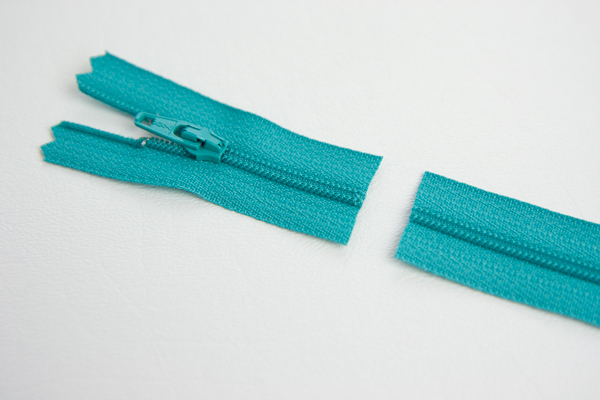 The first step is to cut off the metal zipper stop at the bottom of the zipper. 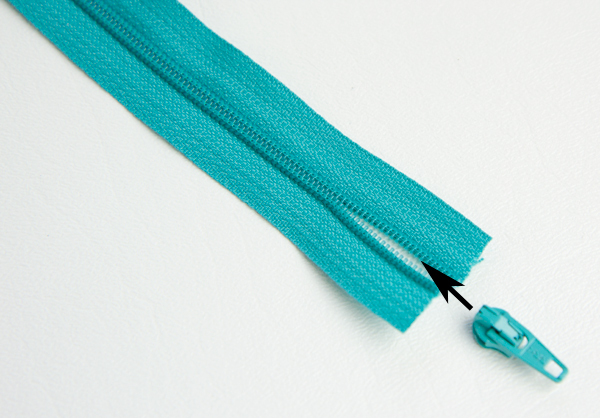 Then, spread the teeth at the bottom of the zipper by pulling gently on the zipper tape on either side. You only need about an inch or two. Then, slide the pull off of the short bit that you cut off. 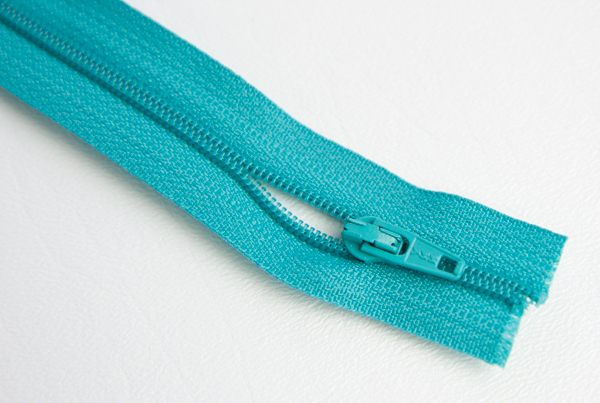 Take the zipper pull and slide it up onto the spread teeth of the bottom of the zipper as shown below. I found that trying to get the two ends in at the same time worked the best, but you might find that doing one at a time works for you. This is a little fiddly and will take a minute. Just keep easing the pull on. 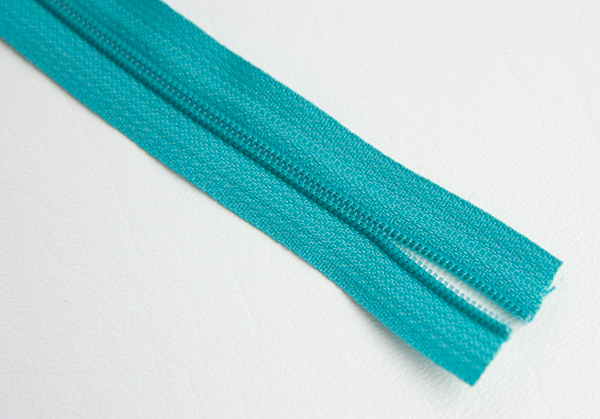 It helps to pull on the zipper tape at the sides to coax the pull back on. When you do get it back on, chances are the teeth will not be exactly aligned as they were before and it’s going to look a little wonky. That’s ok! 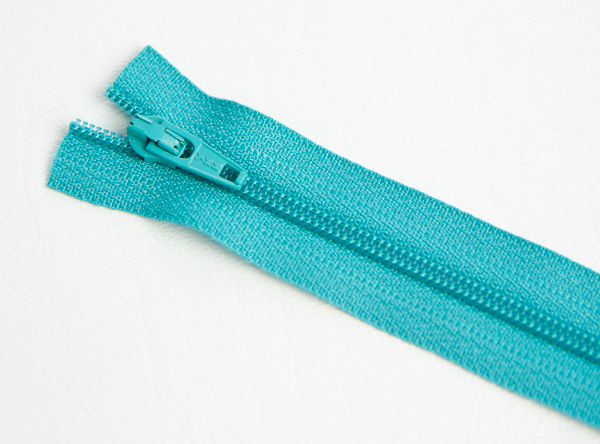 Slowly slide the zipper pull up to the top of the zipper and it will realign all the teeth as it goes. When you get up to the top again, the top edge might not be straight anymore. 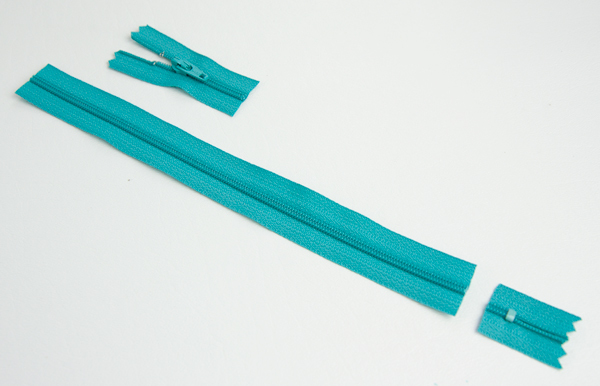 Simply trim the two zipper tapes so they are even again. Woohoo! I hope everyone has a fantastic holiday! I’ve got some fun plans for the new year, so stay tuned! That looks like a really useful thing to know, hate to count the number of zip failures I have had, often just chuck the project in the ‘too hard UFO box’ never to see the light of day again. Love this tip…thanks for sharing! There’s a trick to put it back on from the top as well. It keeps the bottom stop intact if you need it or you can trim it off. I love tricks like this! I need this trick. I have already installed the zipper into my pants! Wow! This could have saved a few tears! Thank you. I am going to share it now. oh dear. I really shouldn’t laugh. But I’ve done plenty daft things while sewing myself. so, having tried this, how many times did you zip it up so far the slider came off the cut top again? !